We frequently get calls asking for an auto body repair quote over the phone. While we always do our best to give you as much information as possible over the phone, don’t be surprised when we ask you to bring your vehicle in for a complete quote! There is a reason why – and it’s to make sure you’re getting the right work at the right price! Read on for Freeway’s explanation as to why we prefer and recommend in person quotes. Vehicles have about 30,000 parts in total, so it’s pretty common for people to mistake what they think needs to be fixed or what part they are talking about. Don’t worry – we don’t expect you to know all 30,000 parts – that’s our job! For example, you may think you have a problem with just your bumper, but not realize that you actually need the surrounding panels replaced as well. Without us being able to see the vehicle, we aren’t always able to understand the whole problem. If our team isn’t able to visually inspect your vehicle, we risk missing something that might change the work (and price) required. 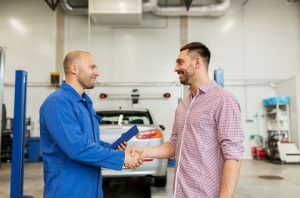 Nobody likes to be surprised by extra costs; by bringing your car in for an in person quote, we can make sure that we know exactly what work needs to be done, and can therefore give you a more accurate price. By inspecting the car in person, we’re able to see exactly what needs to be done to restore it back to its original condition. Knowing what needs to be done ahead of time allows us to ensure we’re prepared with the tools we need and are able to give you the high quality service Freeway is known for. Your time is important. Don’t waste it by getting incomplete or incorrect repair quotes over the phone. If you need auto body work, stop by Freeway Auto Body for a free, in person quote.